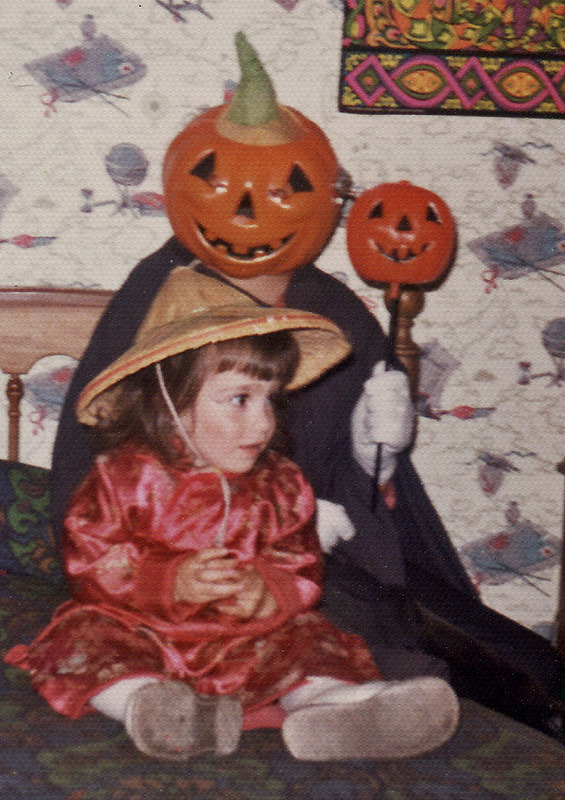 When I was growing up we had a go-to dress up box that was pulled out every time we put on a play or marched in a parade and on Halloween. 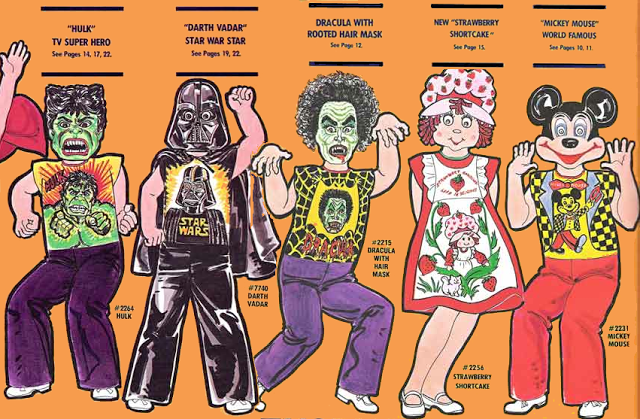 My mother was a master of making simple original costumes that didn’t come out of a package. She created jewelry-laden gypsies, downtrodden hobos with bandana sacks at the end of their sticks, Paul Revere and Peter Pan, all from scratch. My favorite costume was in second grade when she made me into a Brownie spirit. She sewed brown felt over an old pair of sneakers that drew into a point at the toes and fully dressed me in brown. She topped it off with a refashioned stocking cap. 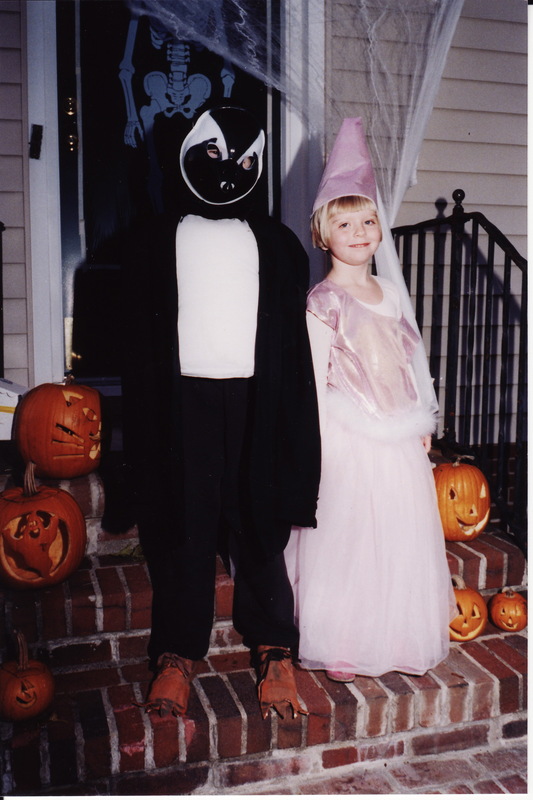 Our town had at least two costume parades each year and we loved them. During the annual Frontier Days celebration my mother used the thin white cardboard that arrived inside our father’s dry cleaned shirts and made prairie bonnets for me and my sisters and the next door neighbor girls. My brother had a raccoon skin cap and she helped dress the neighbor’s boy as Davy Crocket, an outfit my brother had worn previously. We all wore long skirts with aprons and carried baskets and were the most authentic looking early pioneers marching along the main street. At the end of each parade they held a costume contest and we never won. The children who did win were never better dressed than us so we wrote off our loss to poor judgment. The last parade I walked in I was alone without sisters or neighbors. It was the Fourth of July parade and I went as Lady Justice. My mother fashioned a toga with white sheets and draped a wide ribbon diagonally across my chest with “Justice” written over it. She placed two eye slits through another ribbon for my blindfold then laid a wreath of leaves on my head. I held a sword in one hand and a small scales of justice in the other. She instructed me how to march. The winner of the best costume was a young girl dressed as a bride. The girl’s mother kept apologizing to my mom for the award. “Your costume is so terrific, I don’t why they chose my daughter. She was a bride… because it was all we had,” the woman said with a nervous laugh. My mother shrugged it off feeling that everything she did in our town was like casting pearls before swine. It only bothered me. 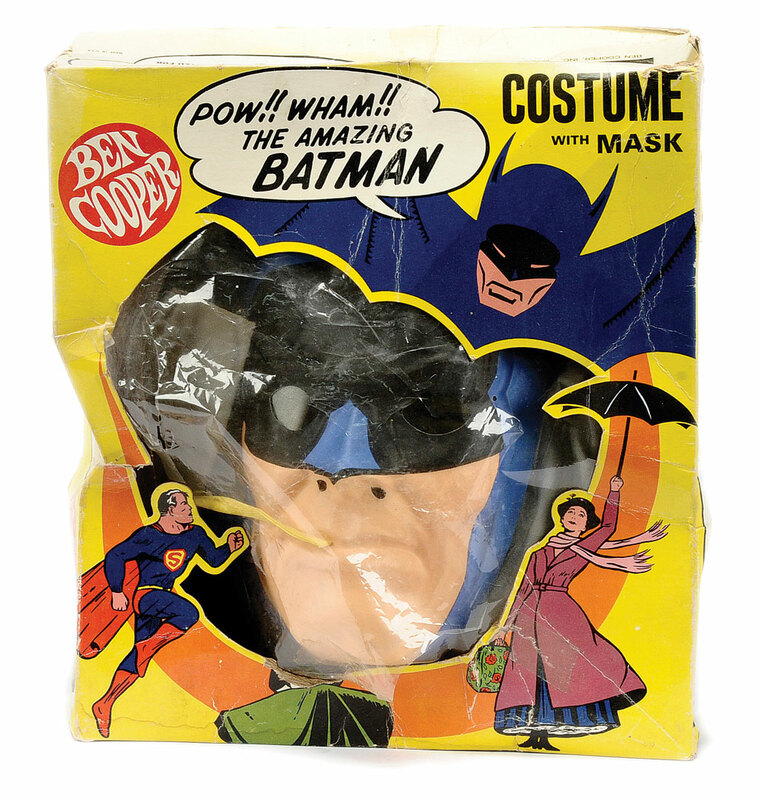 Years later when it was time to dress our son for his first trick or treat Halloween, Rob was surprised to learn that I had never heard of Ben Cooper. He talked about Ben Cooper like he was a real person or better yet, a member of the family but I knew the type of costume he meant: the one with a plastic mask held on by an elastic string in the back and a polyester one piece suit that was screen painted to look something like the character you were representing. You stepped into it and held it on with two strings attached at the neck. Ben Cooper always put the face of the mask on the suit. Just in case you don’t recognize my face, I have an extra face painted on my stomach. I was having none of it. 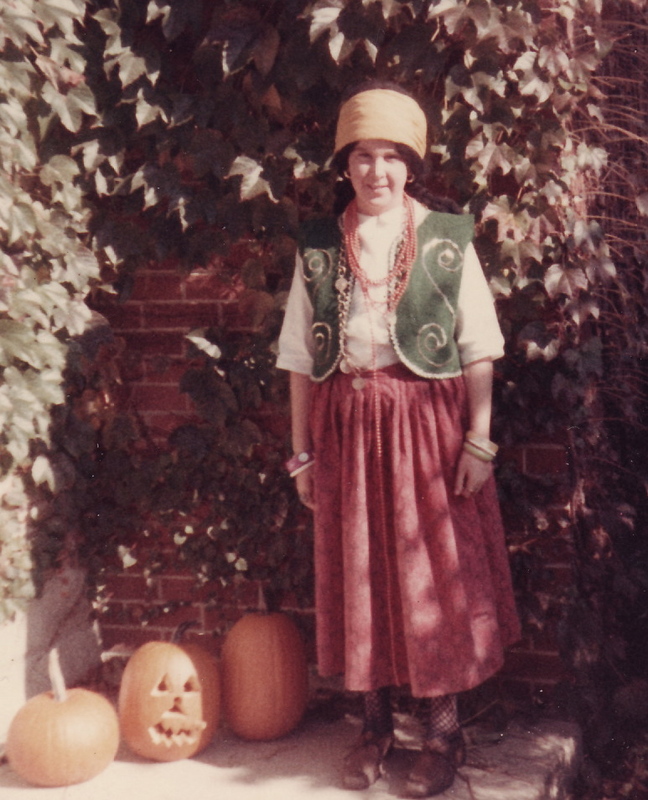 As an art teacher I knew there was no excuse; I needed to uphold my mother’s costume tradition. 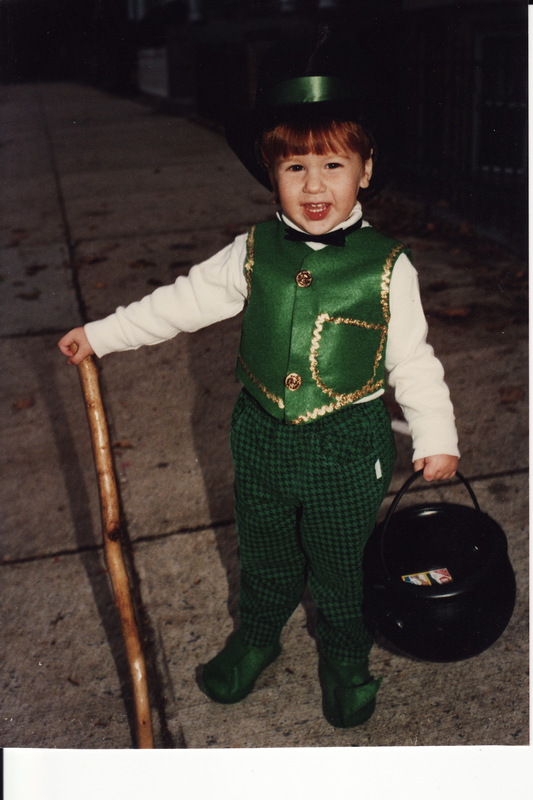 For my son’s first costume I capitalized on his red hair and made him a leprechaun creating green elf shoes after my mother’s sneaker and felt model. We put gold chocolate coins inside a plastic cauldron for his treat bag representing his pot of gold. 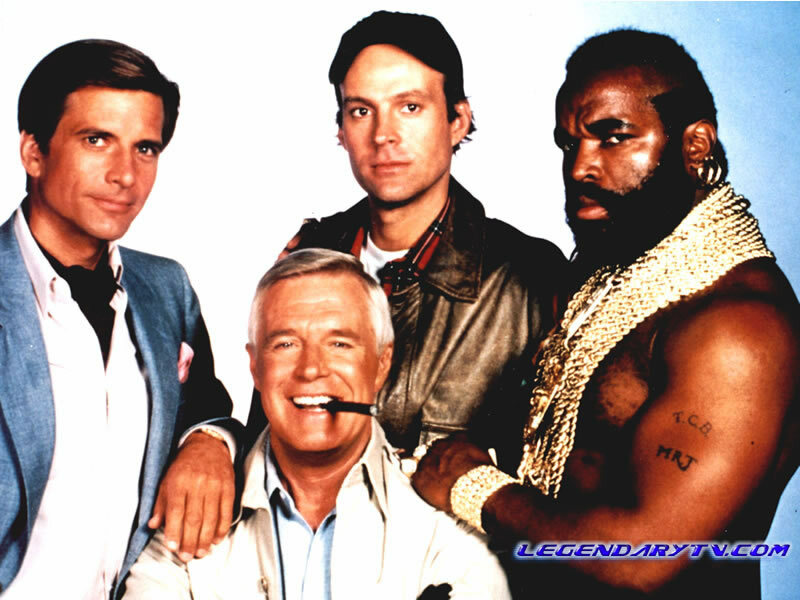 When we knocked on the neighbors’ doors he handed them a coin. He was an instant celebrity. The following year it poured and we skipped trick or treating and went to the local town celebration held inside the high school gymnasium. 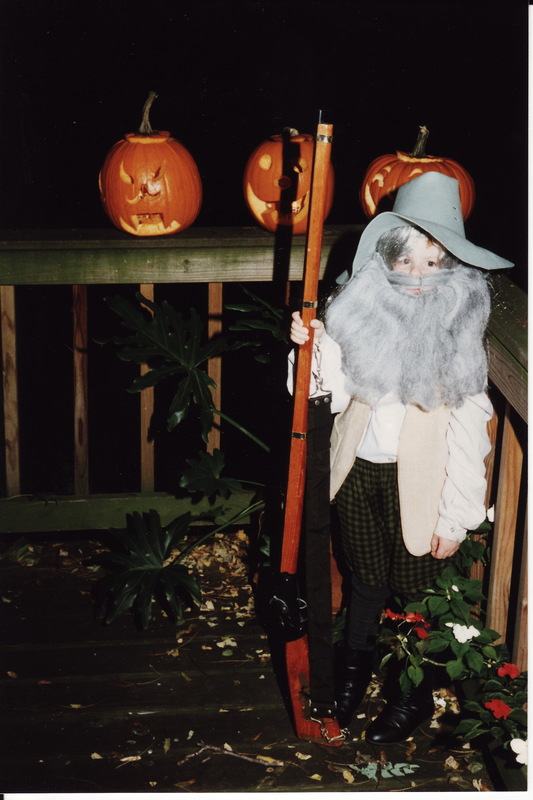 We hadn’t anticipated that there would be a costume contest yet Jackson won first place overall and received twenty-five dollars for being a wizard. Rob was now fully on board. Whatever I decided I was going to turn Jack and Quinn into, Rob prowled the stores for props to enhance my handmade costumes. The next year Jackson went as a young King Tut and won first prize again. I didn’t notice all the losers crying in his wake because I had a forty-year-old score to settle. I mean if you want to compete don’t put on a Ben Cooper Costume for goodness sake. I would laugh it off to friends and strangers alike who complemented the costume as I casually fanned the prize envelope around. “Oh it’s just a silly competition,” I would say. It wasn’t the money it was the “First Place” written on the outside of the envelope that I needed. The next time Jackson went as Rip Van Winkle. He was called old man of the mountain by the teenage judges, but of no consequence since we grabbed the top honor once again. Quinn went as a witch so she was pretty much overlooked in a sea of little witches and being two she didn’t seem terribly fazed by the fact she was never really in contention. The subsequent year I was working during lunch on Jackson’s costume when a colleague stopped in my art room and asked what I was doing. I was painting skeleton bones on black leggings and a sweat shirt with glow in the dark paint. “Well I really like to do this, “ I said continuing to paint bones. “You must, “ she said. A few days later she returned and found me sewing the skull part of the costume to the sweat shirt. “Still at it?” she asked sitting down. “It does take time,” I said. “Of course he does,” I said a little too defensively. The morning of Halloween as I was applying the white pancake make-up to Jackson’s face before school he started to cry. “I don’t want to wear this on my face,” he exclaimed. “You’re sure to win first place tonight.”I assured him. Quinn was happily flitting around us as a fairy casting good spells with her wand. Some of her magic must have landed on me. It was Halloween and there was no time to get another costume or improvise one since I had to get to work. I knew the time to change my ways was at least a year away. So I did what all people do when they’re in a pinch with a first grader; compromise. No make-up was applied for the school costume parade and we skipped the entire town event that evening and let someone else win. He agreed to wear the make-up for trick or treating and the four of us went out for about an hour and called it a night. The next summer while walking through the New York Aquarium gift shop he discovered a plastic penguin mask held on by an elastic. “This is what I want to be for Halloween,” he exclaimed waving a black and white mask that projected a three dimensional beak. “No I want to wear this!” he said slipping it over his head and waddling around in a circle. “No you don’t,” I said with a laugh. “I think he knows what he wants,” Rob said. With that simple purchase on a hot July day in Coney Island I passed the baton to a new generation. Although I still played a hands on role in their creations and Rob continued to be prop master they started driving the bus and the costumes became their own. When we moved to the lake house Jackson went to the school Halloween dance dressed as Phantom of the Opera. It wasn’t a big hit among his friends since he had to keep explaining to people who he was supposed to be. 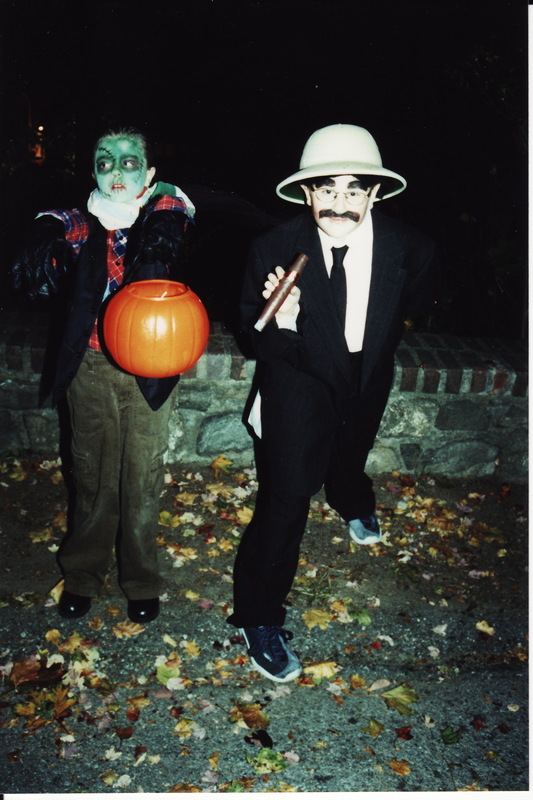 The next year he was in sixth grade and he dressed himself up as Groucho Marx. Rob suggested a pith helmet which we owned. “Groucho wore one as Captain Spalding in Animal Crackers,” he explained. That’s a story that’s had a lot of play in our house over the years. Fortunately the teachers had heard of Groucho since Jackson again unexpectedly came home with first place in the costume competition. 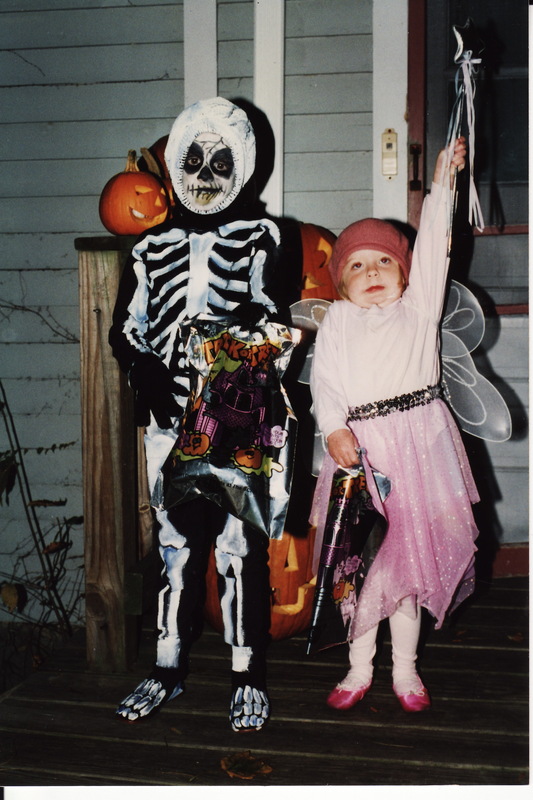 Hopefully my involvement in their early costumes continued to inform their choices about how to make a great costume just as my mother’s had influenced me. Their love of costumes has been sustained to this day. 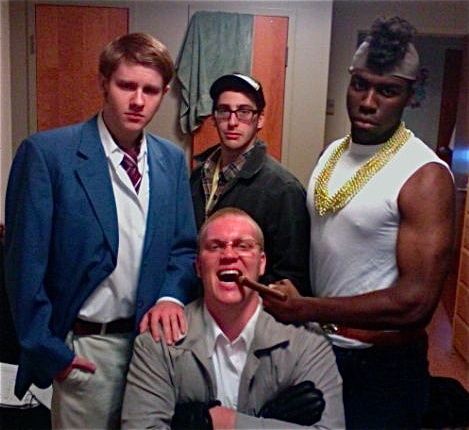 Jackson dressed up for Halloween each year in college and continued to win contests. I’m happy to report none of the other contestants cried. Everyone loves pumpkins, even the hooligans who sneak into your yard under the cover of darkness and smash your jack-o-lanterns. I’m sure they would never smash their own pumpkins. People can’t help falling in love with pumpkins. Pumpkins are the vegetable with personality. So much personality that we carve and paint faces into them in an attempt to bring out their true identity. Growing up in a flat northern Illinois landscape, one of my favorite memories was our annual trip to a small farm less than a quarter mile from our suburban home. The pumpkins had already been harvested and were spread out in size order ranging from 5 cents for the smallest, up to two dollars for the largest. I usually picked out one that cost a dime. It was easy to carry and I could tell it loved me back. 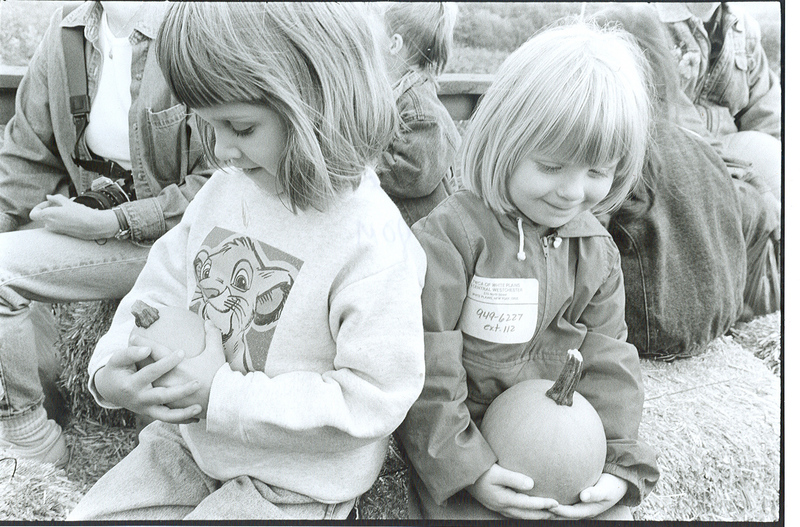 Thirty-five years later, when my own daughter traveled to a pumpkin patch on a school trip, I recognized the instant bond she and her friend had made with their personal selection. I asked my daughter why she had picked out that particular pumpkin. “Because this is my baby,” she answered as she kissed it. 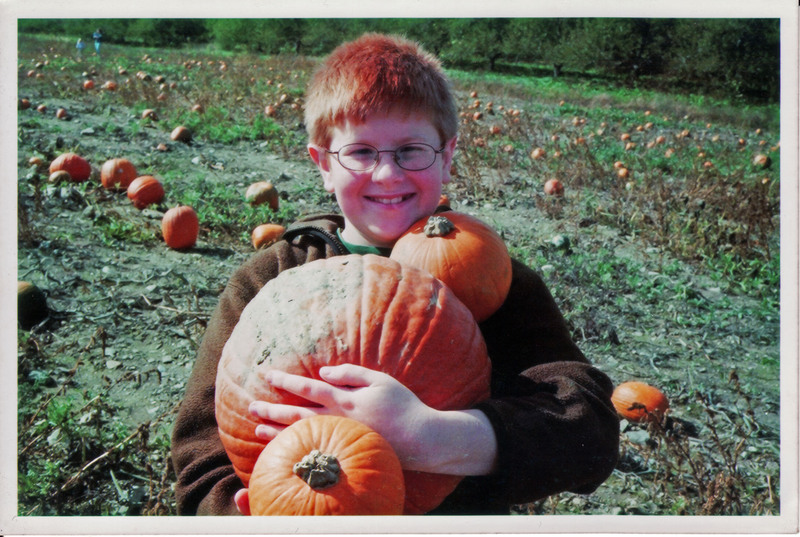 As a young boy, my son had pumpkin red hair and spent his childhood quests for the perfect pumpkin camouflaged among his choices. 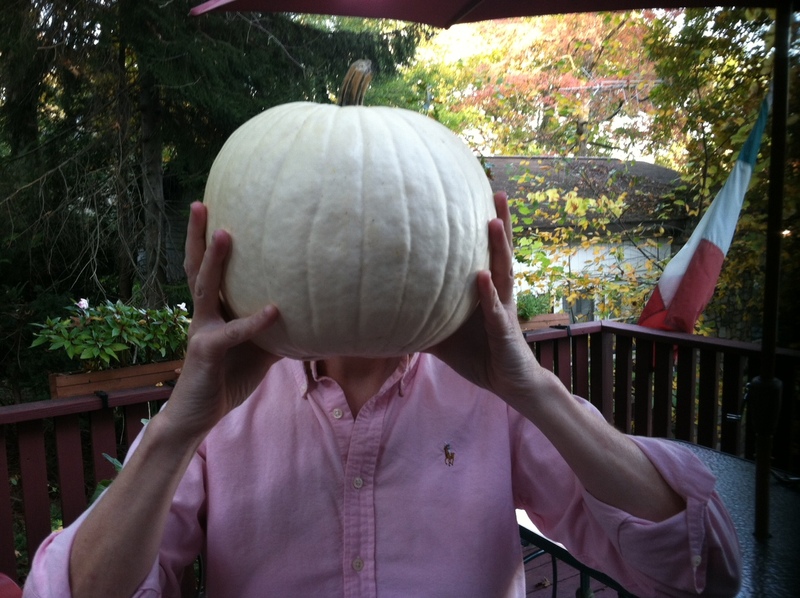 Here was proof that we had pumpkin in our genes. The first year we were married we lived in Brooklyn and when October rolled around we set out in search of pumpkins. We found an old Italian woman selling pumpkins from her vegetable stand. “How much?” I asked the vendor. “What?” The lady squawked at me in a thick accent. “How much are the pumpkins?” I tried again. “Uh, you tell us how much and I’ll tell you which one we want,” Rob said. Needless to say we didn’t buy any from her. But I felt a little sad and guilty. Sort of like someone who goes to a pet shelter to adopt a cat but leaves empty-handed. Those pumpkins deserved better than her. 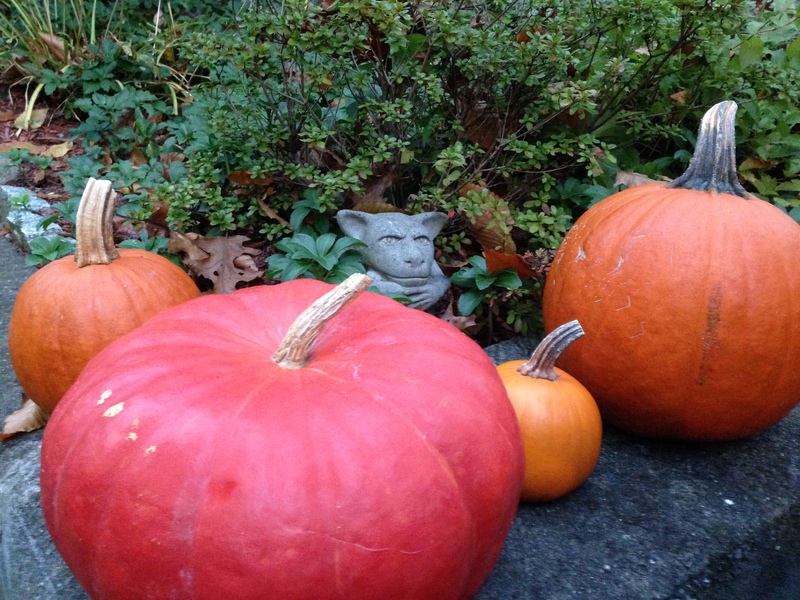 So far this year we’ve brought home five pumpkins. Three traditional orange pumpkins, a Cinderella pumpkin and a white one also known as a lunar pumpkin. The lunar pumpkin reminds me of a relative. He sits on the kitchen table and keeps me company at 6:15 in the morning as I drink my tea and read the newspaper. I keep thinking about putting him outside with the others but I can’t bear to part with him.